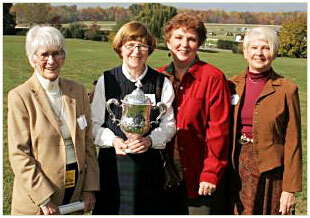 Millie Tyner, center, receives the Madison Family Cup on behalf of the Montpelier Cookbook Committee. On November 3rd, during an awards ceremony held the morning of the 2005 Montpelier Races, past society president John Macon presented the family's large silver cup to the "Montpelier Cookbook Committee" for its outstanding contributions to the preservation and development of Montpelier. Millie Tyner, chair of the committee, graciously received the cup on behalf of the committee. In addition to Millie, other members of the committee were Janet Carter, Marion Coss, Claire Jaenke, Barbara Loffredo, Pat Loffredo, Kay Myers, and the late Bob Moxley. The committee was responsible for creating and publishing Montpelier Hospitality, which is far more than a cookbook. It presents the history and traditions of Montpelier in an enjoyable way and contains terrific recipes, including one for President Madison's whiskey sours. 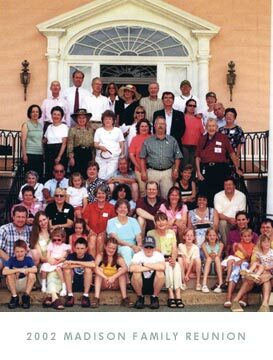 The recipes were contributed from all over the world by Montpelier's visitors, as well as from Montpelier's staff, volunteers, Friends of Montpelier, and Madison Family Descendants. The book was published in March 2002. Since its publication, the proceeds from the sale of the book have gone to the Montpelier Foundation. Montpelier Hospitality can be ordered from the Montpelier gift shop. The gift shop's address can be found on Montpelier's web site, should you care to add the book to your library.